Soul POG, Multi-Effects for Electric Guitar from Electro-Harmonix in the POG series. Adding the Soul Food’s clean boost, enhanced touch response and added headroom to the Nano POG's polyphonic sub-octave and octave up, the Soul Pog retains all the controls each of them possesses as a standalone pedal, so that they can be used independently or linked together - even with the possibility to have either appear first in the chain! A built-in effect loop has also been added, enabling the user to insert other pedals between the two. Also, a new "Mode" switch in the Nano POG section now lets the user select the algorithm used for the octave up sound, to either favor fast single-note playing or enhance the harmonic content of chords. 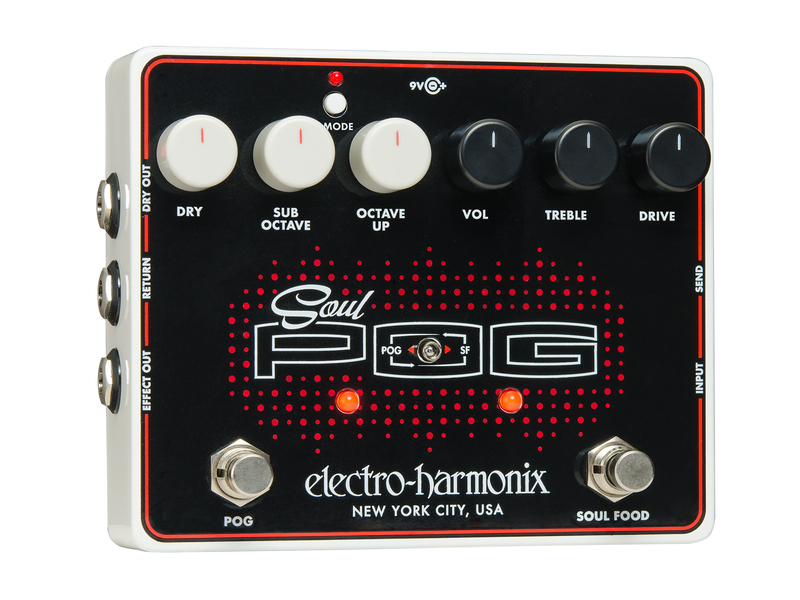 The Soul POG comes equipped with a standard EHX9.6DC 200mA power supply. It is available now, with a U.S. list price of $381.40. More details available at EHX's website. PRS brings back bolt-on neck CE 24 model With the CE 24, PRS brings the bolt-on platform back to the brand's main lineup, adding some significant updates on the way. [NAMM] Sauvage Guitars to display One Piece Master Sauvage Guitars will display its unique One-Piece Master guitar at the NAMM which starts ten days from now. New models and improvements at Manne Guitars Manne Guitars has two unveiled new models and announced an improvement in the technique used for their guitars' body-neck joint system.